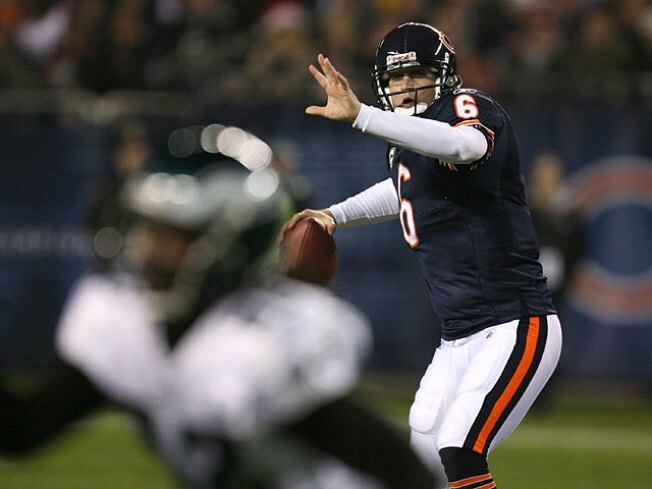 Jay Cutler had three chances to torch the makeshift Eagles secondary for a score. Three times, he blew it. A week after a five-interception game, Cutler's struggles continued in Week 11 and the Eagles held off a late drive to top the Bears 24 to 20. The win moves the Eagles to 6-4. The Bears, meanwhile, suffered their fifth loss in their last six games and (almost) officially removed themselves from the postseason picture. A weak Eagles secondary was supposed to be susceptible to Cutler. Not so much. Jay Cutler's weekly struggles in the red zone didn't improve, as Cutler overthrew several chances for touchdowns -- including to a wide-open Devin Hester on what should have been a guaranteed score and a late deep throw to Johnny Knox that would have given the Bears a late fourth-quarter lead. Cutler did manage to put the Bears in the end zone with a toss to Kellen Davis in the third quarter. The Bears had a chance for three more in the fourth when cornerback Charles Tillman forced a fumble from Eagles running back LeSean McCoy. Robbie Gould's subsequent kick was blocked, and the Bears' 20-17 lead remained. Gould, whose four field goals kept the Bears in the game early, was the Bears' best offensive player of the night. The Eagles had few problems with the Bears' defense. Donovan McNabb finished with 244 yards and two touchdowns on 24-of-33 passing, much of which went to wideout DeSean Jackson, who ended with 107 yards and a touchdown. Meanwhile, McCoy finished with 99 yards on 20 carries, and even QB Michael Vick had a 34-yard sprint, his longest of the year.